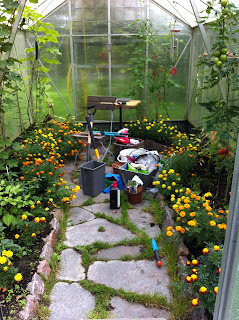 Swapping the city lights for rural Sweden: Tomato time! next year, but next time 4 instead of 2 plants. 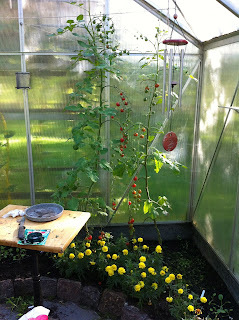 bush tomatoes - I could have grown them in front of other, taller plants. had another plant or two, space-wise. Work-wise I guess I saved a bit of work in the spring, sowing, repotting, mollycoddling, moving plants in and out, etc. But after that, I have still had to water and fertilize the entire greenhouse so it wouldn't really have made that much difference. Perhaps pinching out the side shoots etc, but how long does that take? So. Verdict? Six plants is too few. Perhaps 8-10 is about right... I guess I'll find out next year. Super Sweet - and they really are! Sweet - just above it to the left. So that just leaves the pretty. I was really hoping for a pretty, neat and tidy greenhouse this year, with lots of flowers and no dirty tools, pots, fertilizers. Well I guess I did get a lot of flowers (I sowed marigolds around the edge of the border as I was told they were good bug-preventers), and they GREW like crazy. But I wouldn't say it was pretty this year. My tool shed is just that bit too far from the greenhouse, and I'm just a bit too lazy. Perhaps I should just accept the fact that (without a lot of effort and discipline) a working greenhouse can't look like they do in the magazines...? Irisarna jag fick fröer till av dig växer som bara den. Vill du så kan du se dem på bloggen i dag! Så snygga tomaterna på den understa plantan är! Har du hunnit smaka? Hoppas de var goda! Your greenhouse may not look pretty in your eyes but I'm still very envious! I'd love to have a greenhouse (in my community garden one would get too knocked about by kids). 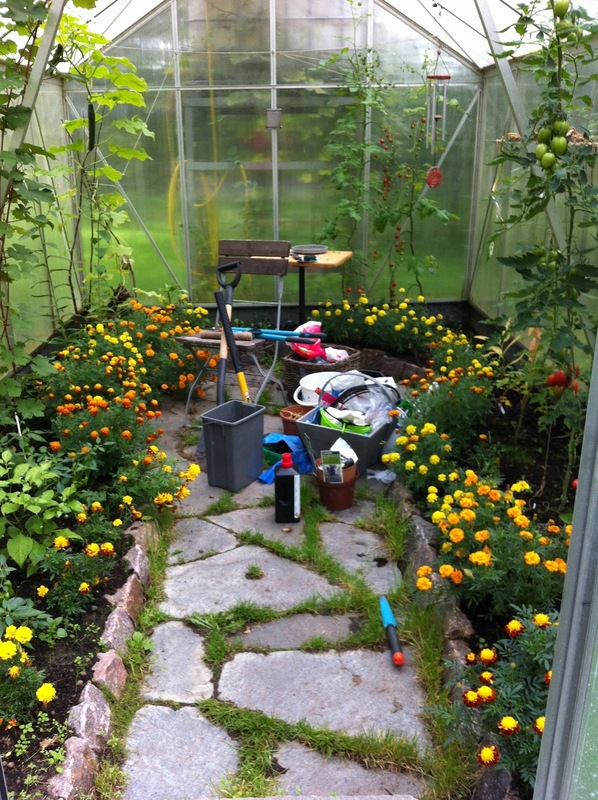 And as I love marigolds, I think your greenhouse looks great - although I agree lots more tomatoes would have made it even better!